Several recent stage works have been exploring friendship and love in homophobic Uganda. Hansol Jung’s intriguing play takes its name from an anecdote told by white pastor’s daughter Chris in its first act and a black minister in its second. In a nutshell, the metaphor-like story involves a poor family’s cardboard substitute for an actual piano and the ability to fix it after it is ripped up by its young recipient. By analogy, this thoughtful play asks, will understanding and compassion repair a Uganda torn apart by bigotry and violence? Hope informs the early going as Chris and her love Adiel share personal vows privately at their Ugandan religious center in a society where lesbian love is considered an abomination. Jon Savage has rightly designed the church as an austere meeting place with simple wood and a large cross. The tenderness of the women’s kiss-blessed wedding — purposely recorded on tape as a kind of testimony to their love — may briefly call to mind the union of Romeo and Juliet, though of course the latter also includes supportive Friar Laurence. Their joy is unsurprisingly short-lived with the entrance of a volatile rebel soldier and a somewhat melodramatic but nevertheless haunting first act curtain. By contrast, the second act begins with a curiously very hearty pastor sermonizing about the Good Samaritan. Eventually Minister Paul will behave quite at odds with the big heartedness of the role model in question. Quite soon a visual hint will clue in audience members to having seen him before in a very different context. At the same time Paul’s wife Ruth has moments when her patience succeeds in trumping his impulsiveness. The difference in their responses reaches a telling crescendo in dealing with Chris, who has returned with a wrapped up square and a request as unusual as the package she carries. Paul may denounce Adiel’s cousin Francis for being gay, but he has a terrible secret for which Chris has reason to condemn him. 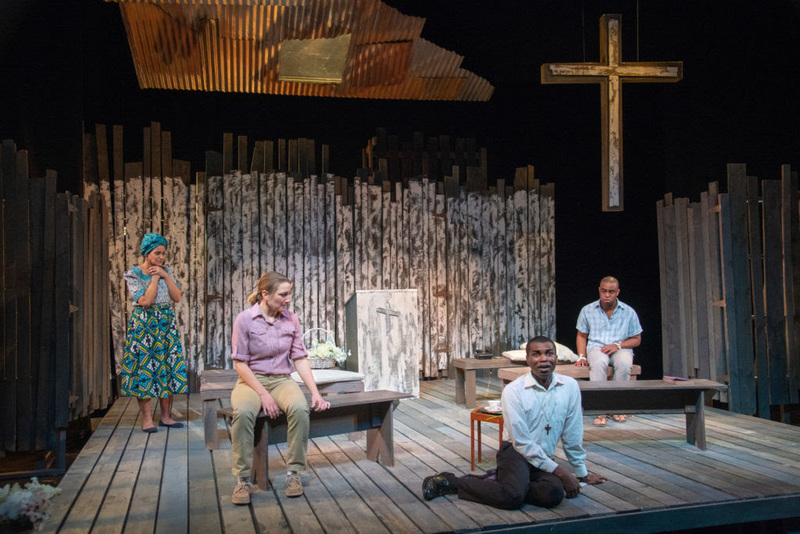 Playwright Jung brings back the title imagery and pivotal anecdote but Chris correctly tells the pastor that there is something connected to the dead that he cannot fix. Under Benny Sato Ambush’s taut direction, there is nothing to fix about the cast’s performances. Marge Dunn finds Chris’ sensitivity with Adiel and her arresting ferocity with the pastor. Rachel Cognata captures Adiel’s sweetness and vulnerability on the one hand and Ruth’s growing impatience with her husband’s scary inflexibility on the other. Michael Ofori has the right authority as a soldier and fine complexity as the pastor. His second act sermonizing is a standout passage. Marc Pierre catches soldier Pika’s tenacity and Francis’ muted angst. At a key moment, playwright Jung describes Chris and Francis as being on the same bus – a connection that could be philosophical as well as literal. In a similar vein, director Ambush and his stellar fellow traveling quartet make their upcoming journey something to celebrate and “Cardboard Piano” a well-played if disturbing instrument. This entry was posted in Uncategorized on March 31, 2019 by CambCooks.